Hello Koh Phangan! Wonderful island paradise in which we already fell in love with 7 years ago. 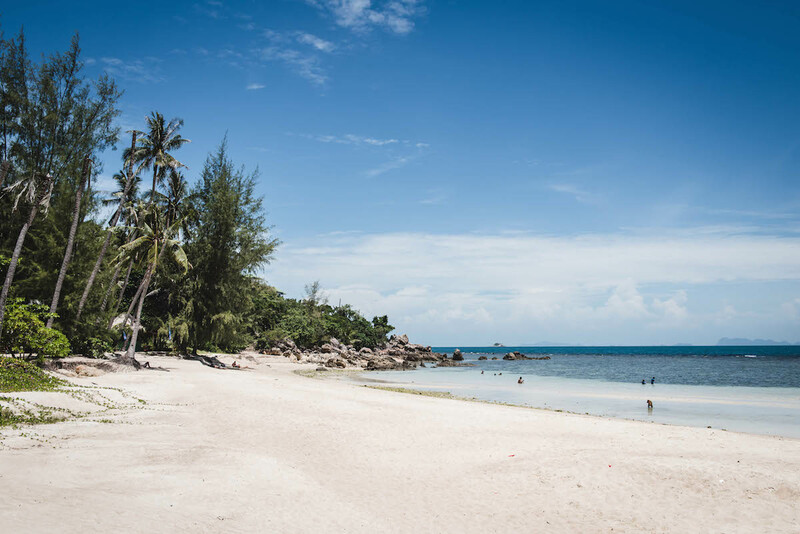 When we clicked on “Book Now” on a cool afternoon in May, it was clear: Koh Phangan will finally see us again after so many years of abstinence. We had a bit of stomachache at the thought of how much might change in seven years. 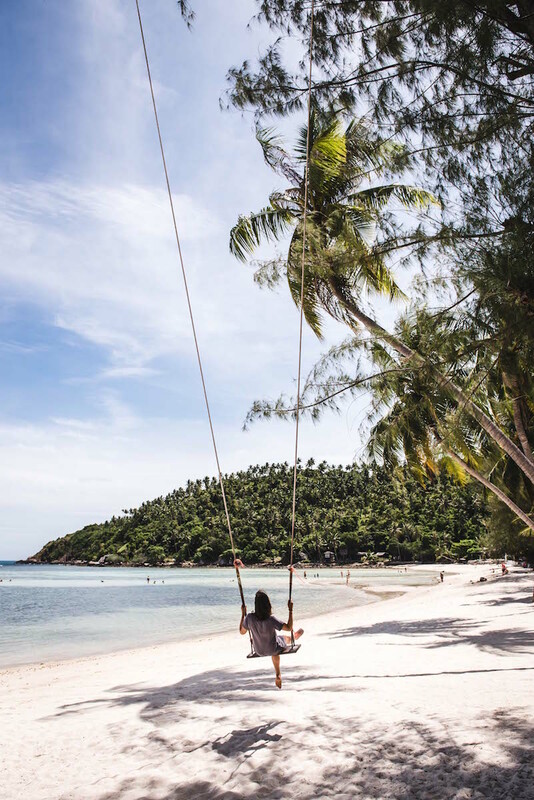 But within a few hours on the island, we knew that Koh Phangan is still the same laid-back patch of earth we have known and loved back then. 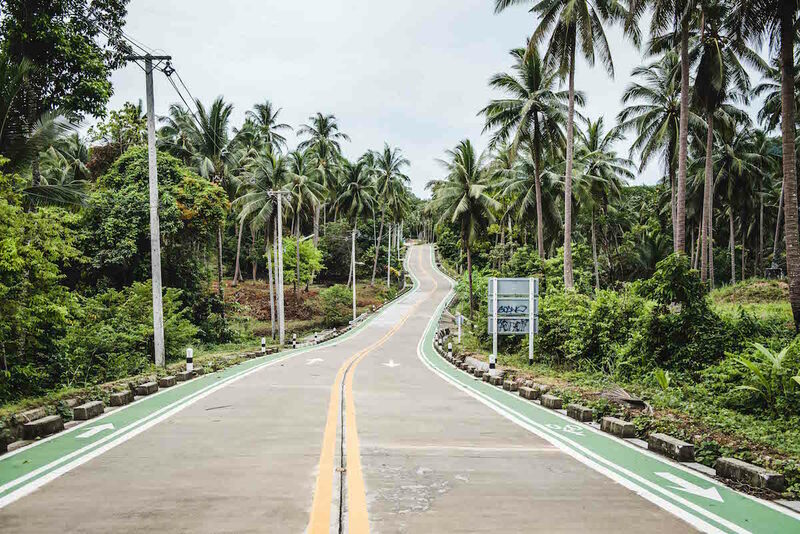 Unlike Koh Samui, there is relatively little traffic on Koh Phangan’s roads. In addition, the distances are shorter, which means you can explore the island perfectly on a scooter. With a scooter we visited almost all beaches on the west coast of Koh Phangan. 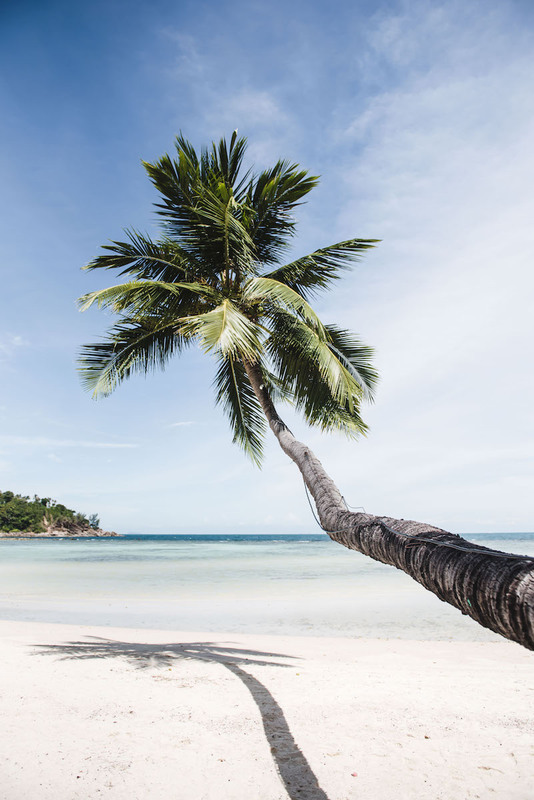 The scenery is kind of similar: finer to slightly coarser white sand, turquoise blue water and a few beach bars where you can sip a fresh coconut. However, if you like to swim in the sea, you really have to get familiar with the tides. During the summer months, when the tide is low, swimming in the sea on the west coast becomes difficult to impossible. In addition, plenty of corals are washed up, so you have to be careful where to step. However, the wonderful view of the turquoise waters makes it up. One of our beach favourites was the very idyllic Haad Salad. The sand was especially fine and in general we liked the relaxed atmosphere. We also found the perfect swing under the palm trees here. A dream, right? We also found the Haad Mae Haad very nice, which is located in the north of Koh Phangan. 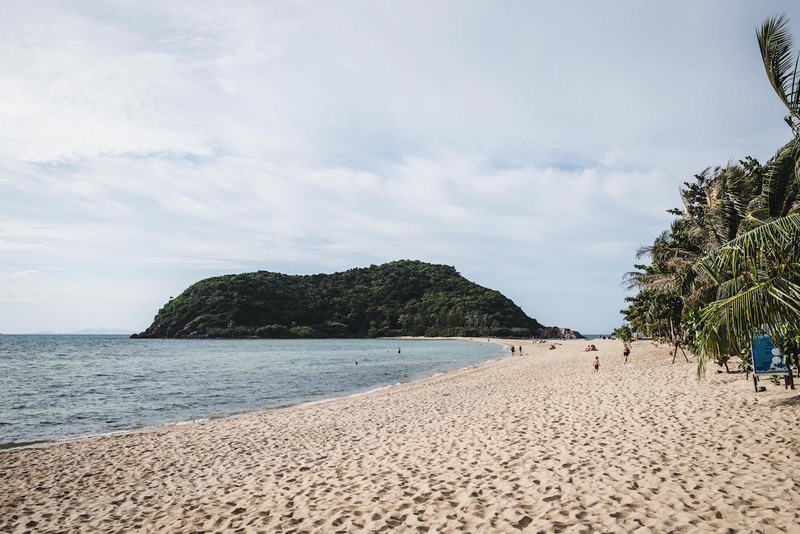 Over a sandbank you can walk to the offshore island (“Koh Ma”). No insider tip, but still worth a visit, is the so-called Secret Beach, which is officially called Haad Son. 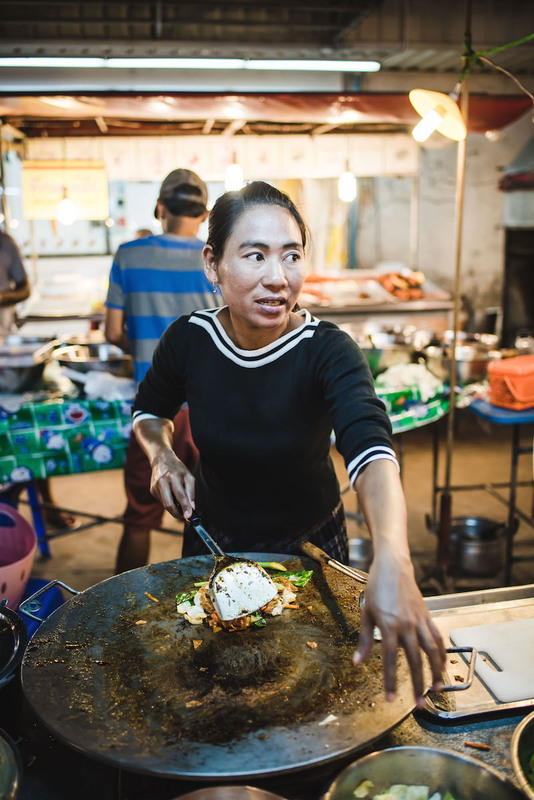 The breeze of the humming fan cools the beads of sweat, on the tiny TV set runs a Thai sitcom, and Ying Ying stands in the open kitchen. She is throwing the chili peppers into the hot oil, causing heavy coughing among the guests at the small street restaurant. Ying Ying’s kitchen was one of the first Thai restaurants we visited on Koh Phangan and it remained our favourite until recently. 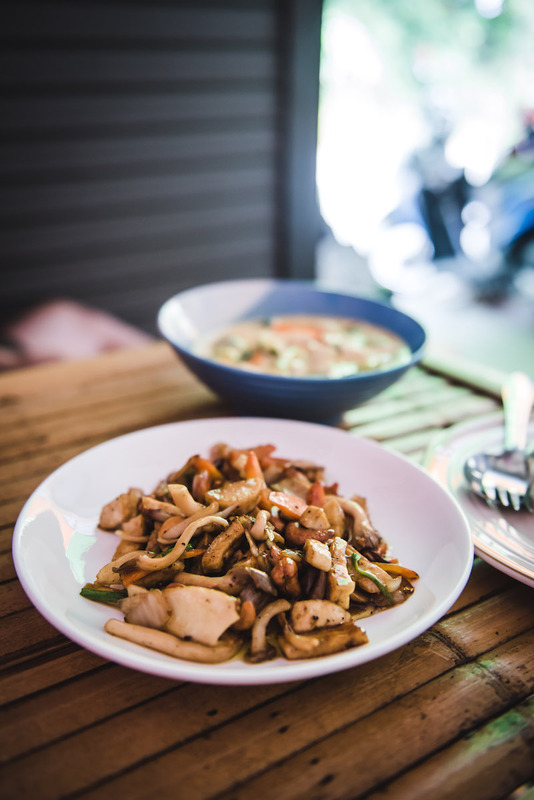 The big advantage for us as a full-time or part-time vegetarian: You can order any dish with either meat (chicken / pork) or tofu. In terms of taste, everything we tried was excellent. The prices are comparatively cheap. All in all: More than recommended! Also excellent is the House People. We had the best Khao Soi for a long time (if not the best ever!). In addition, the staff are very, very friendly. 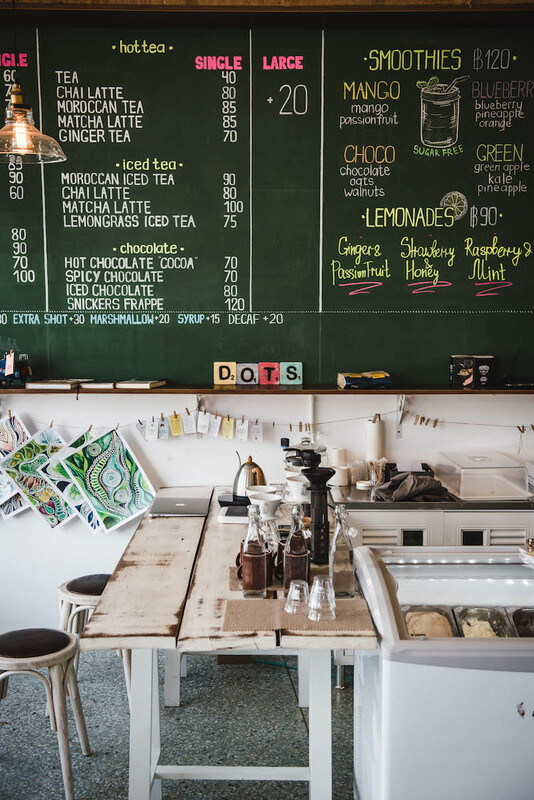 If you are a coffee junkie, like we are, be sure to stop by the Dots in Thong Sala. 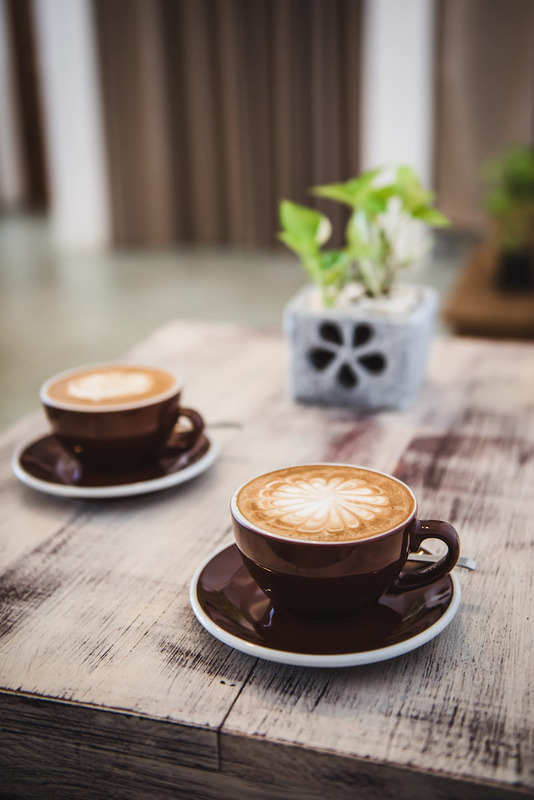 They serve the best cappuccino we could find on Koh Phangan. A little paradise for foodies is the night market in Thong Sala (daily from 17 o’clock). 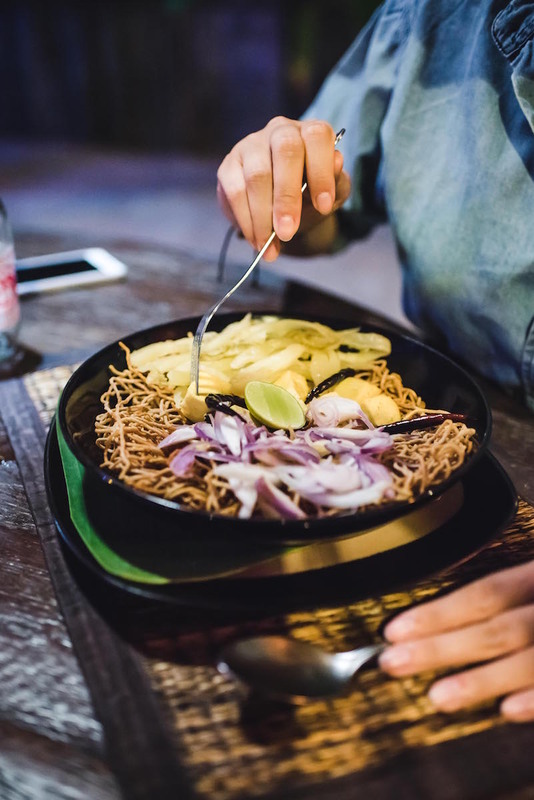 It is visited by many locals, therefore the vegetarian selection (unfortunately) is very limited but Pad Thai and pancakes are available. If the weather plays along, the west of Koh Phangan is blessed with great sunsets. Of course you can admire the sunset simply from one of the many beaches. 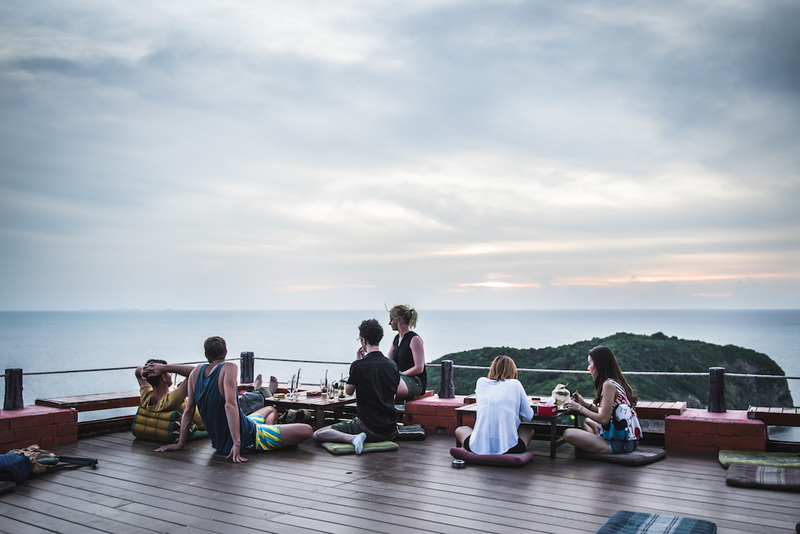 We prefer going to a bar most of the time, and there are a lot on Koh Phangan. 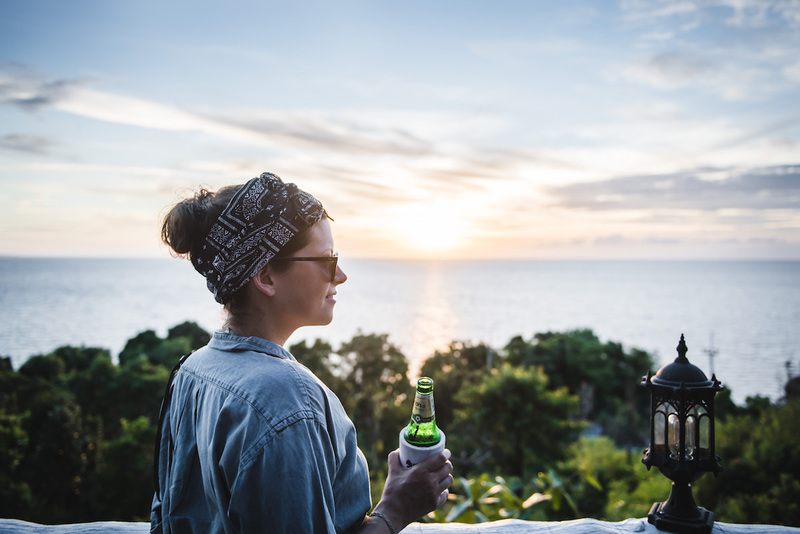 The most famous and most visited bar in Koh Phangan is the Amsterdam Bar, where people meet every evening to celebrate the sunset with a beer. 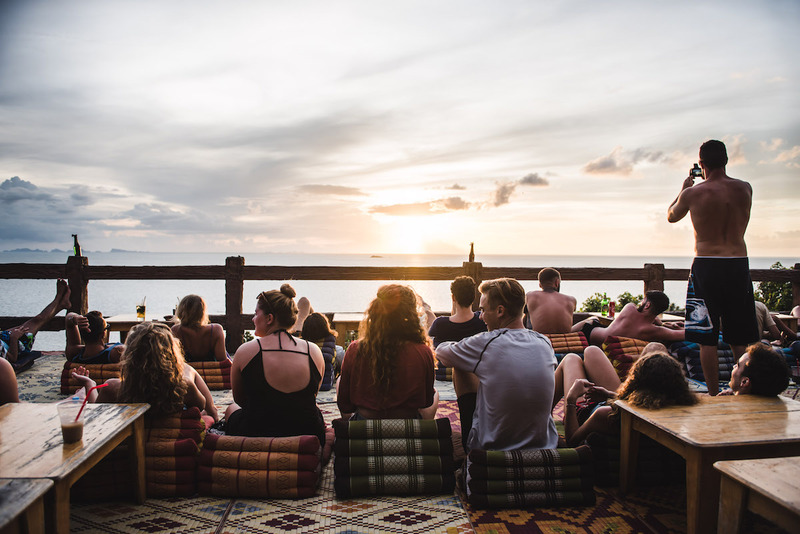 The audience is a mix of long-established Koh Phangan expats and young travellers. The name already reveals it: The Top Rock Bar is located on a small platform surrounded by huge rocks. You have to conquer a few steps and at the end a narrow ladder to enjoy the view. The atmosphere is very special. You have to see it! One of the newer bars on Koh Phangan is located in the north of the island. The Three Sixty Bar was opened on the roof of a building. 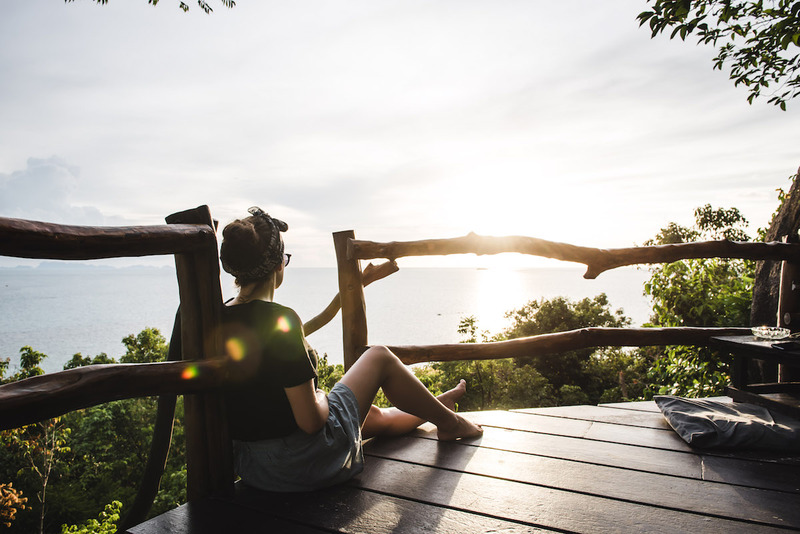 From there you have a wonderful view of the sea and the small offshore island of Koh Ma. The Dudka Bar is one of the less popular venues. The bar is cool and has a nice interior, unlike the Amsterdam Bar for example, where you can sit on the floor. The mood is relaxed, the music is pretty cool. We liked it here! Of course you can also approach the individual spots with the Songthaew (shared taxi). With a scooter, however, you are more flexible and also in a cheaper way. For 24 hours, the rental usually costs around 250 baht. You will find scooter rentals throughout the island. The catch is: There is no insurance. This means that you always have to pay for any damage yourself. 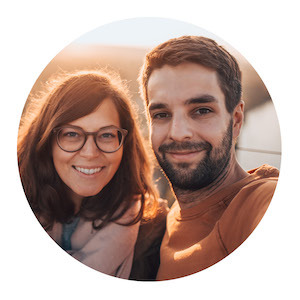 When renting, the passport will be definitely required as a deposit. We always have a bad feeling about it and try to avoid it. Instead, we always provide a different ID (for example Kathi’s driver’s license) and a cash deposit. That worked so far. There is generally little traffic on the roads in Koh Phangan. However, you have to be prepared for the fact that it is very twisting and hilly. Just going straight is not possible. Most of the roads are paved and in good condition – but there is always one or the other pothole. Refuelling is possible either at gas stations or at the roadside. At about 27 baht per liter, gas stations are slightly cheaper than the small shops at the roadside, which offer gasoline in liter bottles of 40 to 50 baht each. Last but not least, we can highly recommend our accommodation on the west coast. In the Sun Moon Star Resort we had a nice bungalow with terrace and a nice view. The owners are very friendly and the breakfast is also very good. Did you explore the west coast of Koh Phangan by scooter too? Do you have any tips or other experiences? We would be happy to hear about it in the comments!